Fenton Field (110 Mile) – Coming Soon! Argus Newspaper Collection of Photographs, State Library of Victoria. 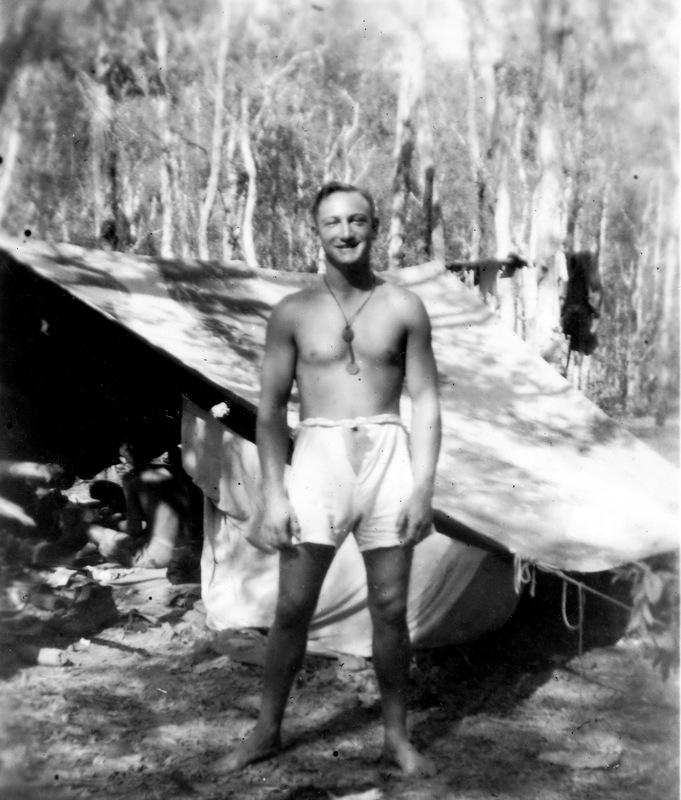 The aim of this page is to document and engage in a study of the range of different World War Two tent sites across the NT. 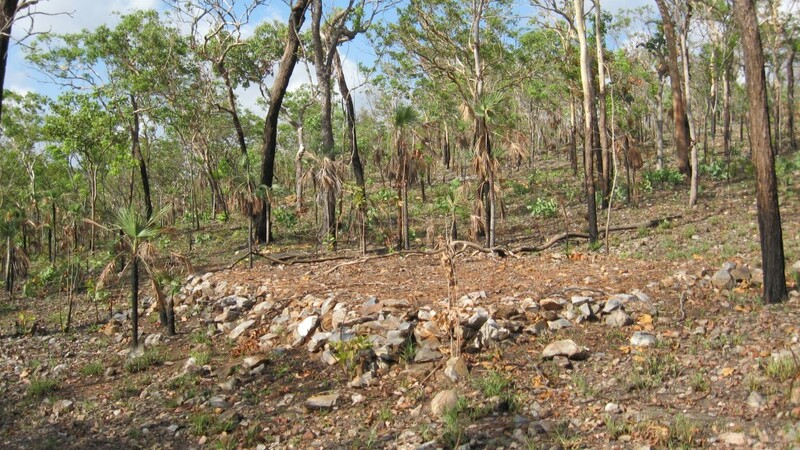 Tents were a very important commodity in the NT as often there was not enough building materials available to construct permanent living quarters to accommodate all personnel. 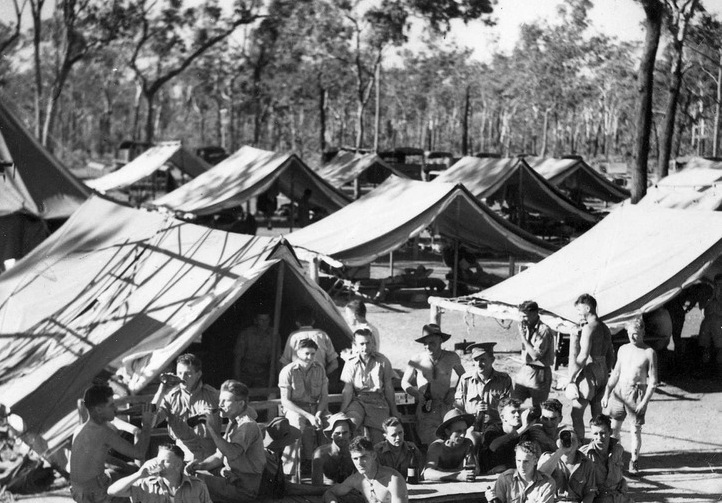 An idea of how important tents were to soldiers in the NT can be gauged by the fact that when the 8th Battalion moved to 41.5 Mile camp, they took over some 143 tents left behind by the 2/4 Pioneer Battalion, not to mention the 72 canvas shelters or ‘fly’s’ they also occupied. (2nd AIF war diaries, 1939-45 War, Australian War Memorial, AWM52, 8/3/45-005). 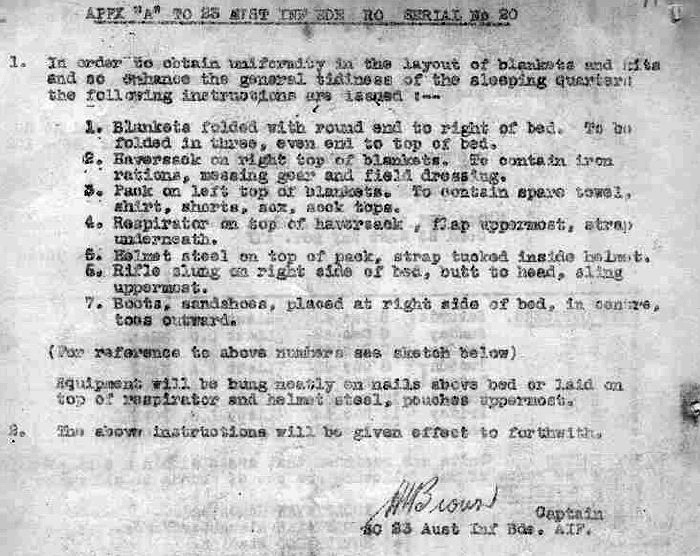 The importance of tents was not lost on command with the 23rd Infantry Brigade HQ issuing the following general order to the Battalions under its control, highlighting the importance regarding the correct placement of tents. (2nd AIF war diaries, 1939-45 War, Australian War Memorial, AWM52, 8/3/23-016). The construction of these tents sites is quite interesting in so far as many different techniques and styles emerged as soldiers sought to adapt their accommodations to the range of environmental circumstances in which they found themselves. 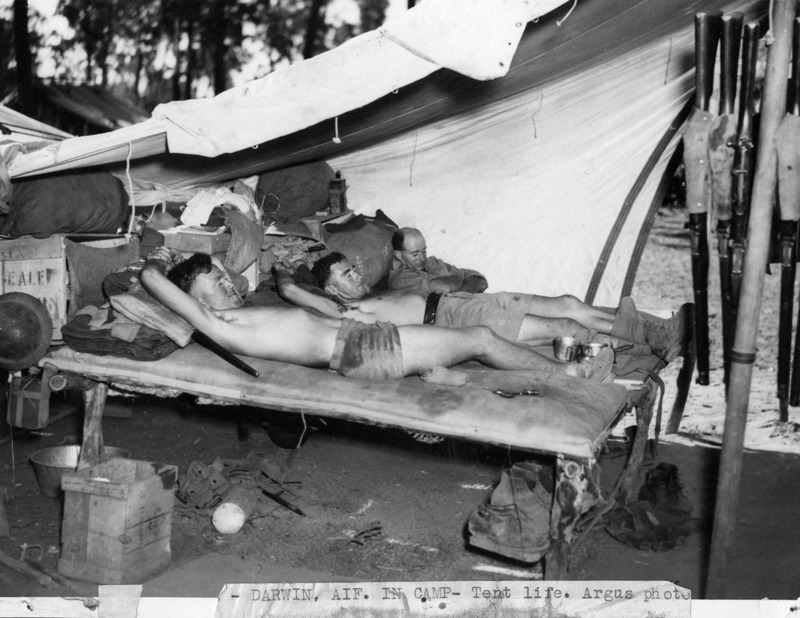 Many soldier’s sought to make themselves comfortable while at the same time adhering to proper regulation. It was this situation that often resulted in the creation of some innovative tent sites. 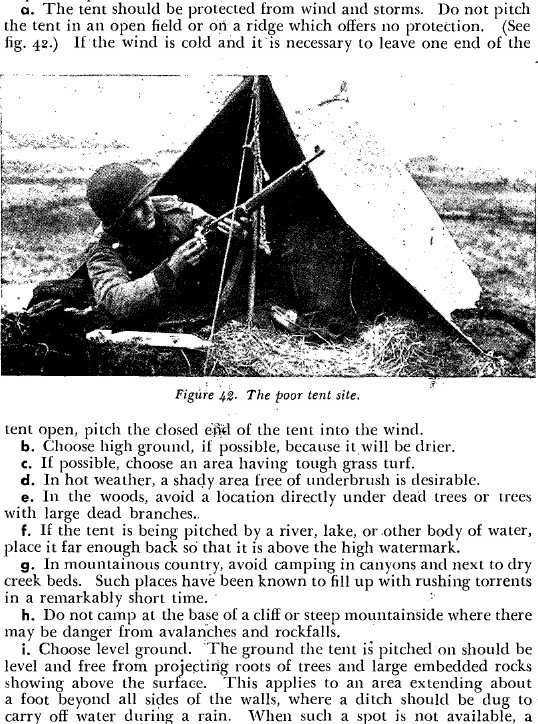 The elaborate and or simple nature of tent sites was dependent on many factors during the war. 1. The duration of time in the said location, 2. the skill set of the soldiers, 3. army regulations, 4. the desire to combat the wet season, 5. camouflage, 6. the access to suitable building materials, 7. the location itself and 8. comfort. 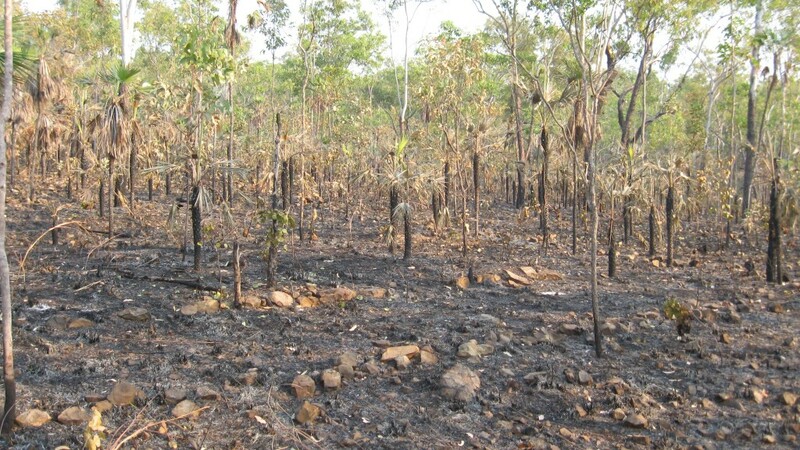 The desire to ensure that tent sites was adequately constructed to cope with the wet season, as can be gauged from the document above, seems to have occupied a position paramount importance in the eyes of most of the soldiers in the NT. Hence most tent sights seem to reflect this concern with tent floors raised considerably above the ground (if on flat areas of land) and drainage channels dug around the back of those on the slopes of hills. A tent site (38 Mile) that has been raised above the ground using rocks and packed earth. 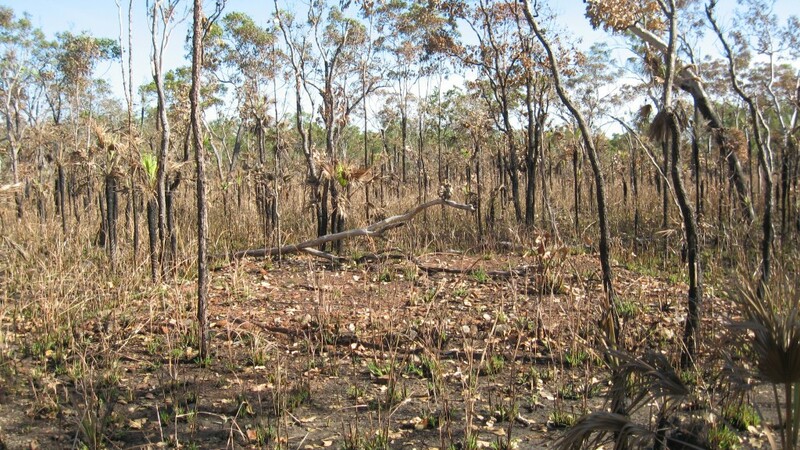 Often the earth would be acquired from termite hills as it was supposed to contain some substance that kept mosquitoes as bay. A very good example of a raised tent site at 51 Mile. This particular tent site is situated in a low lying area and is subject to flooding during the wet. It has been raised quite a considerable height above the ground. An officer at work in a very well constructed Staff Sergeants I.P. (Indian Pattern) tent site with wooden floor boards. These boards must have been a temporary measure as NT termites have a veracious appetite and would have eaten through these in a short space of time. Note the use of both the ‘cycas armstrongii’ (cycad) and the ‘Livistona humilis’ (palm) in the construction of the walls. 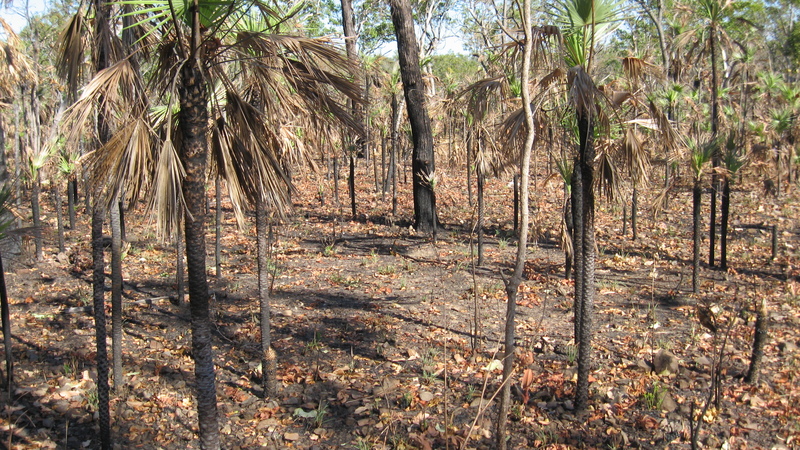 Bush timber was used wherever possible to supplement the supply of conventional building materials from the southern states or that which was scavenged form Darwin. 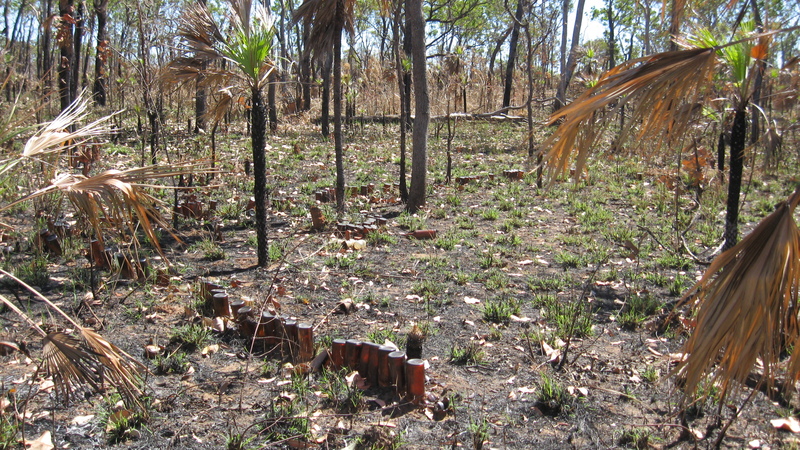 The backs of ww2 camp sites in the NT are littered with tree stumps, a testament to the thorough use of local timber and the shortage of other more suitable construction material. A good example at 48 Mile Camp. This large tent site is representative of those found in the 42 Mile area. It is composed of one large rectangle (flat) and one smaller rectangle inside the large rectangle (raised). 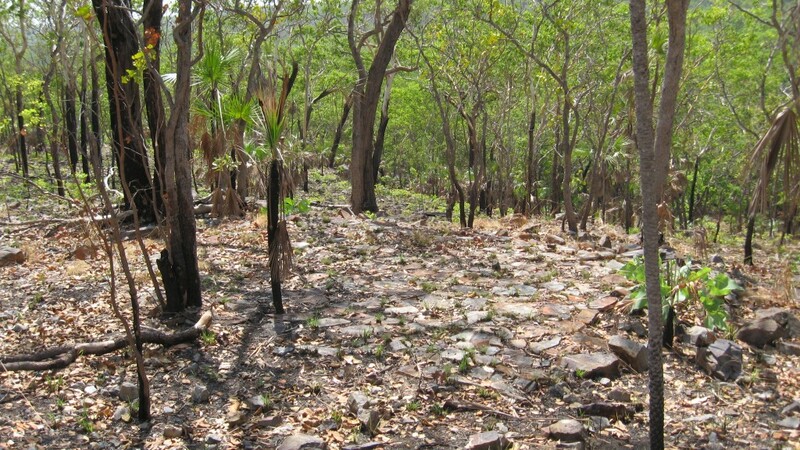 The large rectangular area has been cleared and lined with rocks while the center rectangle is also lined with rocks but raised above ground level. The purpose of this configuration at present is not known but it is supposed that this particular tent site had no walls being covered with a simple canvas tarp and hence only the center section provided security from the rain. (see example below). Simple canvas D^D I.P. (Indian Pattern) fly stretched over the tent floor (49 Mile). 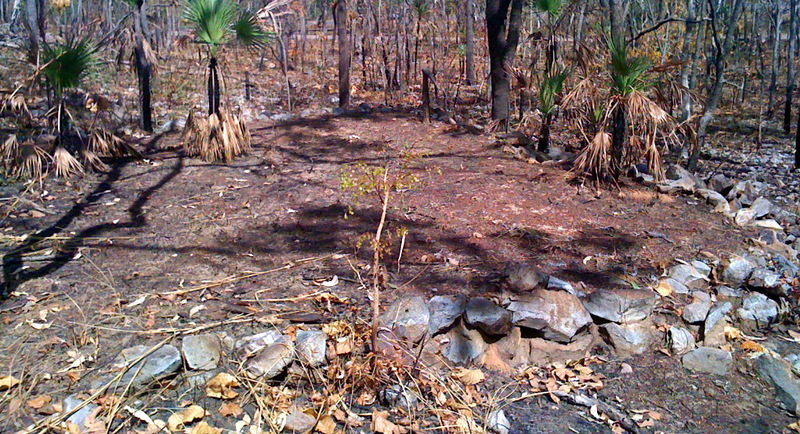 Note how the main support of the tent is served by a native tree. Note also army camp stretchers. Taken by Ronald J. Halliday (S21356), Authors Collection, 2014. The corner of the raised center rectangular section. This tent site (42 Mile) has a drain that runs in a “V” shape around the side of the tent facing the slope of the hill (left). 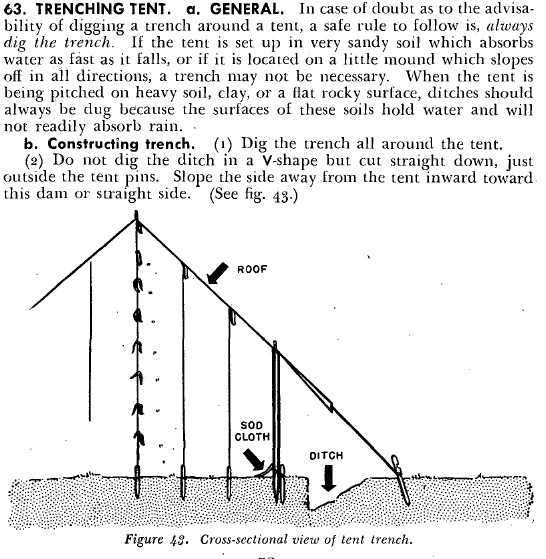 These tent sites are known as “Trenching tent sites”. 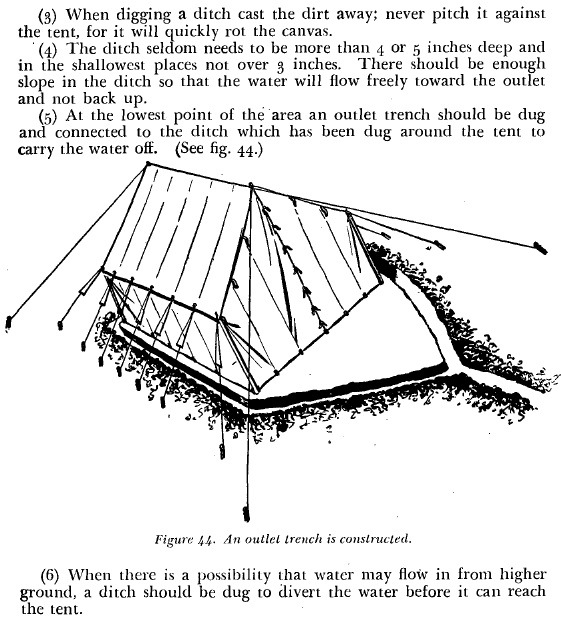 The Australian/Commonwealth manual for tent pitching (1939) states the following about constructing drainage for tents. Tent terraces appear most at sites where there are hills and hence the leveling of the ground was necessary before the placement of a tent. 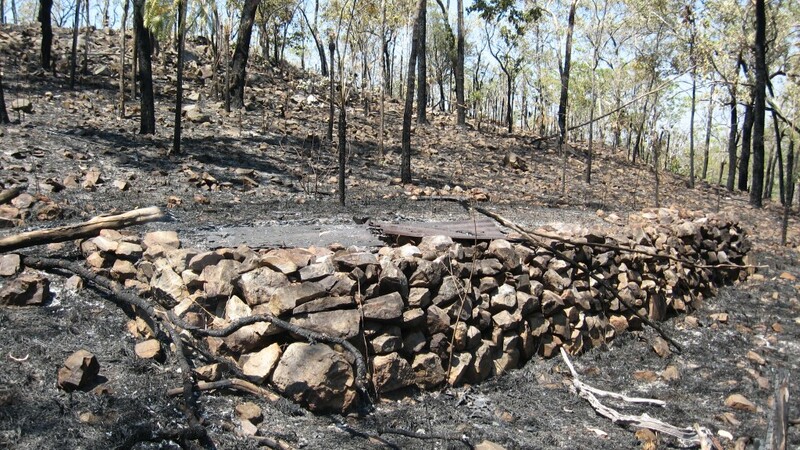 Some tent terraces in the NT have simply been cut from the side of the hill (side excavated tent terrace), while others use stones to create a platform of sorts that juts out from the hill (side platform tent terrace) while others use a combination of both (excavated platform tent terrace). Another very elaborate side platform tent terrace. The support for the platform has been constructed from very intricately placed stones. 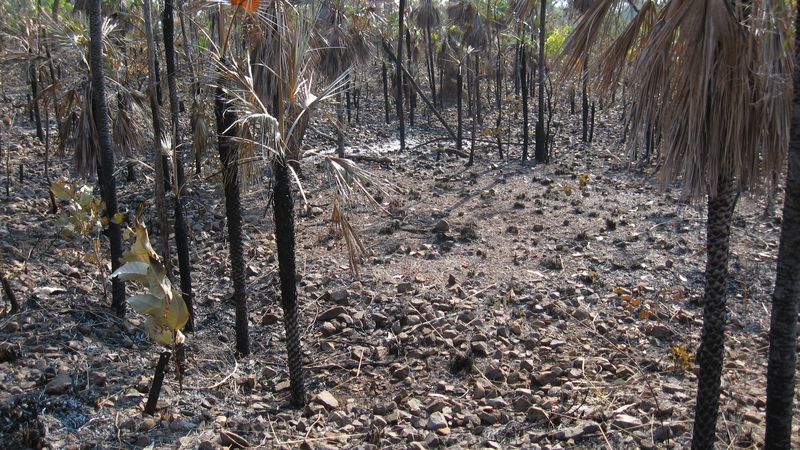 During the dry season when new units arrived in the NT, many tents were sited directly on the ground with no elaborate constructions attempted. 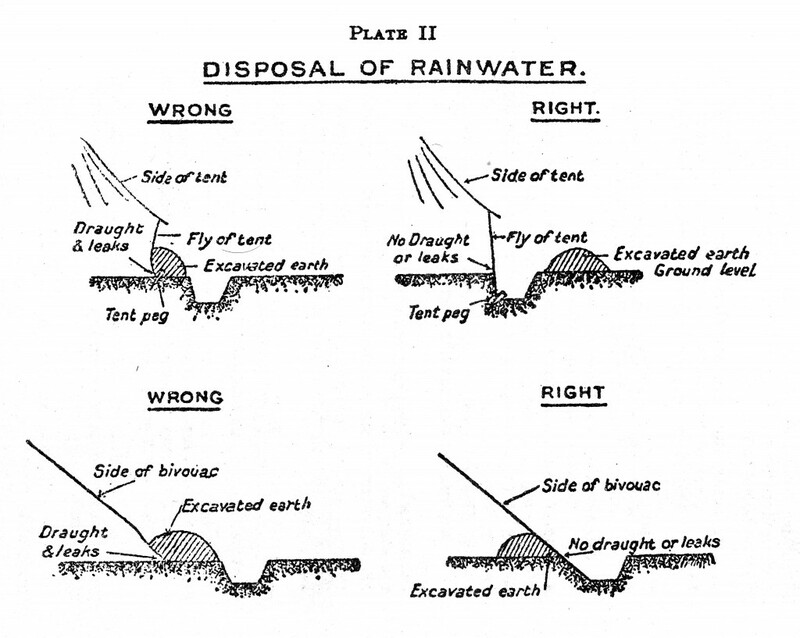 In such cases, if the tent was sited on rocky ground, stones were removed from the floor of the tent leaving a clear outline in the earth when the tent was removed. The clearing of the ground allowed for Sand Palms (Livistona humilis) to take hold following the war and one often finds clumps of these palms marking the presence of a tent site. The presence of star pickets and other tent pegs left in the ground is another good indication of the presence of a tent. 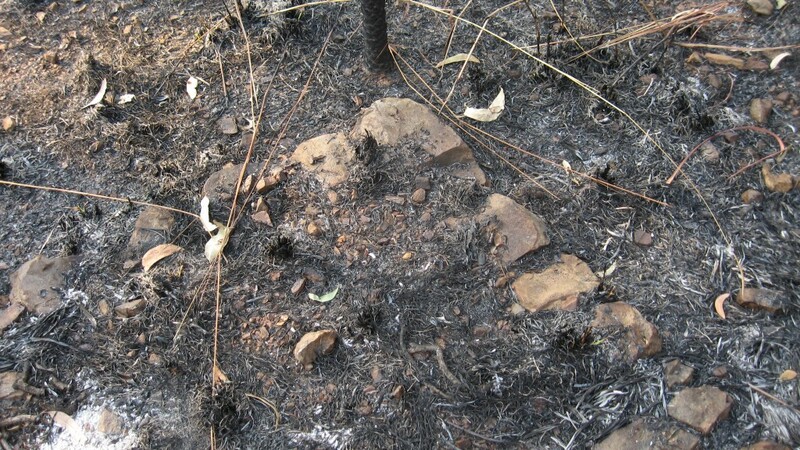 The impression left in the ground from the presence of tent with most of the stones being removed from its center. A Department of Defence I.P. (Indian Pattern) tent set out directly over bare ground. Taken by Ronald J. Halliday (S21356), Authors Collection, 2014. 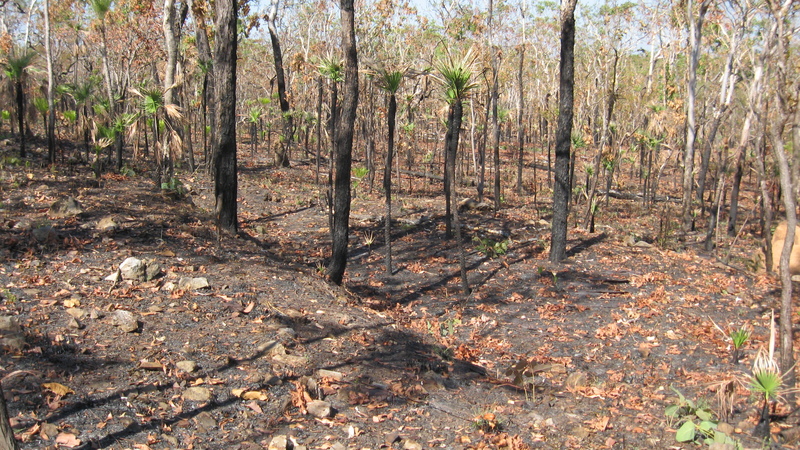 A ground tent site which has been lined with up-turned bottles, marking the corner of the tents previous location. A rather elaborate RAAF tent with two D^D fly’s from an I.P. tent used to create one large living area, complete with porch which has been constructed directly on the ground. Note the use of both the ‘cycas armstrongii’ (cycad) and the ‘Livistona humilis’ (palm) in the construction of the walls and the angle trench in the foreground. Information and photos regarding the camouflage of tent sites is scanty at best, although there is some information contained within the war diaries that does provide some insight. The following is taken from the General orders issued by the 23rd Infantry Brigade HQ in February 1942 before the attacks of the 19th to all Infantry Battalions under its command stressing the need for camouflage from the air. (2nd AIF war diaries, 1939-45 War, Australian War Memorial, AWM52, 8/3/23-012). 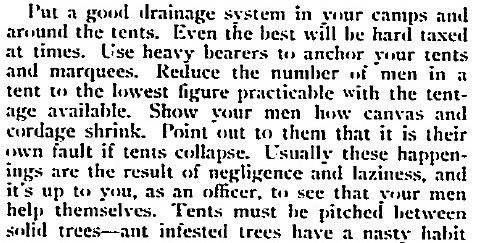 A more specific order regarding the camouflage of tents was issued by the 23rd Infantry Brigade HQ in May of 1942. 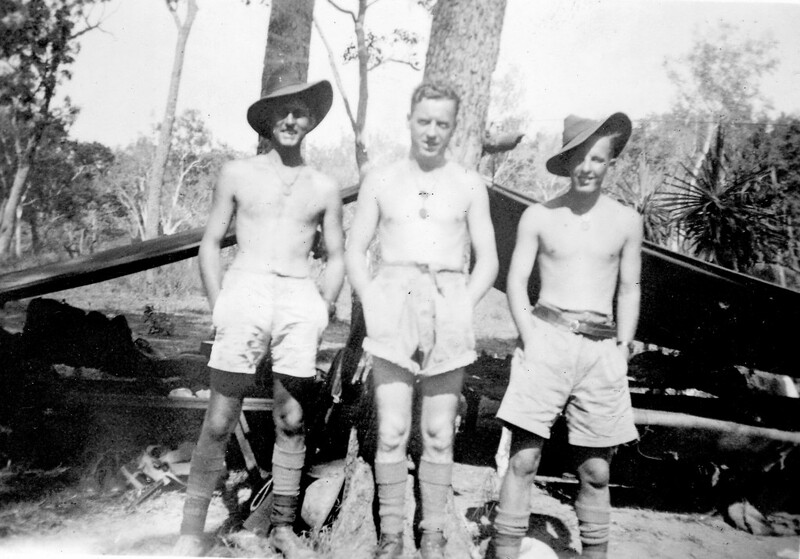 (2nd AIF war diaries, 1939-45 War, Australian War Memorial, AWM52, 8/3/23-013). 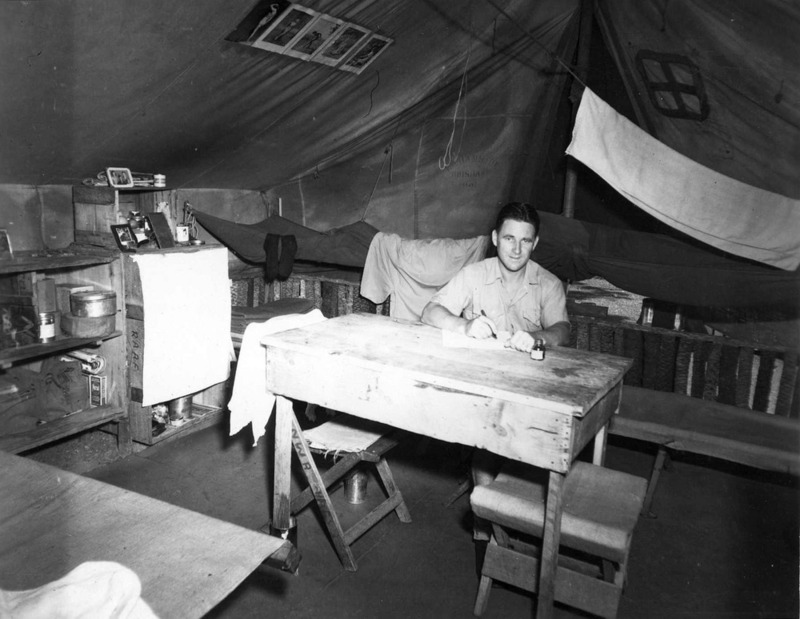 The pattern required to be painted onto tents in 1942 is provided to us by the 2/8th Infantry Battalion (AIF) at 68 Mile. Instructions for painting this pattern onto their tents is as follows although photographic evidence has yet to be located to support this general order. (2nd AIF war diaries, 1939-45 War, Australian War Memorial, AWM52, 8/3/8-025). The following highlights the expected layout of a soldiers sleeping quarters. As can be assumed there were variations to the general rule when we examine photos of the period however the documents below give a good indication as to general arrangement within a tent and what type of equipment was present. (2nd AIF war diaries, 1939-45 War, Australian War Memorial, AWM52, 8/3/23-017). 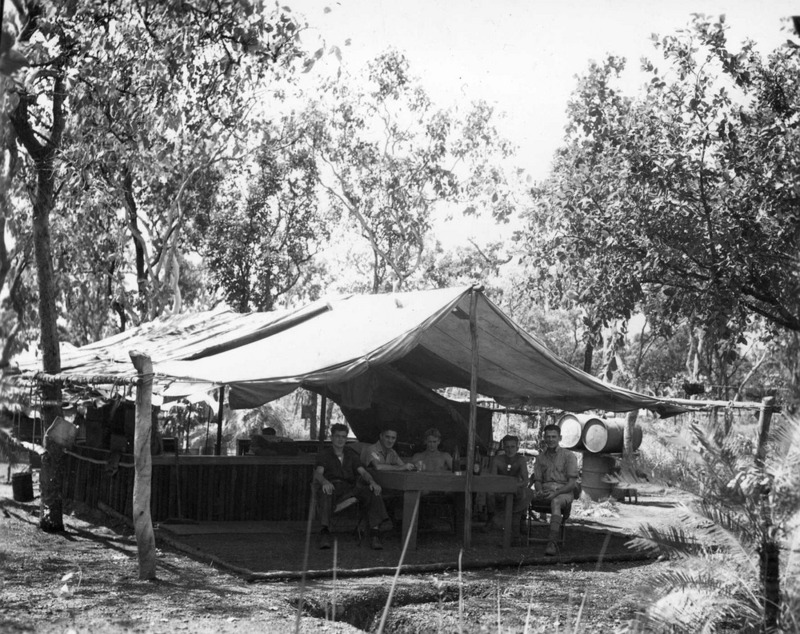 The above photo illustrates a number of key features of the layout of a tent in the Northern Territory in WW2. The first is the soldiers beds. 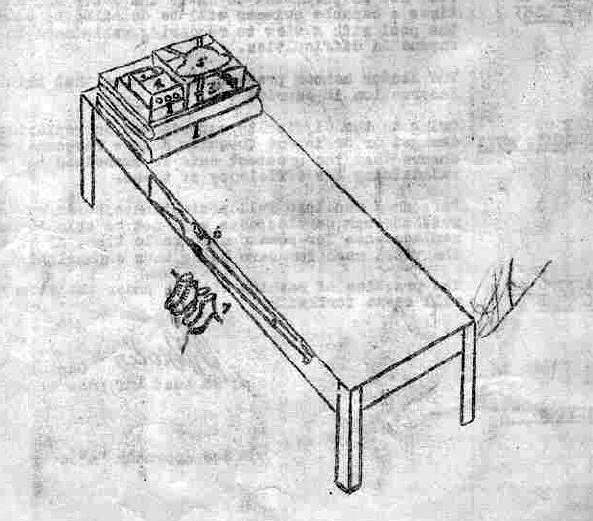 In many cases these beds/stretchers were constructed using local timber as is the case with the photo above. Standard army camp stretchers were also used but due to their flimsy nature they tended to break easily. 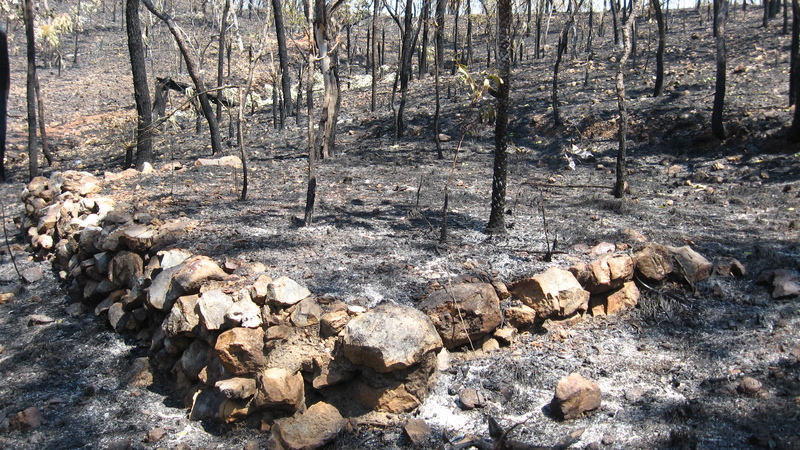 In testament to the unsuitability of army camp stretchers to the NT, many metal stretcher hinges litter every camp site in the NT. The soldiers in the photo have tried to comply with regulations and have most of their essential equipment at the head of their beds, including their helmets. Where they deviate from regulations is in the position of the rifles and boots which have been suspended in the air. The boots have been hung under their beds in an attempt to keep unwanted insects from crawling inside. The .303 SMLE rifles, sporting action covers, have been suspended high from the roof of the tent in an attempt to keep their actions free from bull dust which was easily kicked up in camp and by passing trucks during the dry season. Bull dust was such a hindrance to small arms serviceability in infantry that constant maintenance was required to keep them functioning correctly. Moister getting into ammunition during the wet season also caused cartridges not to discharge. 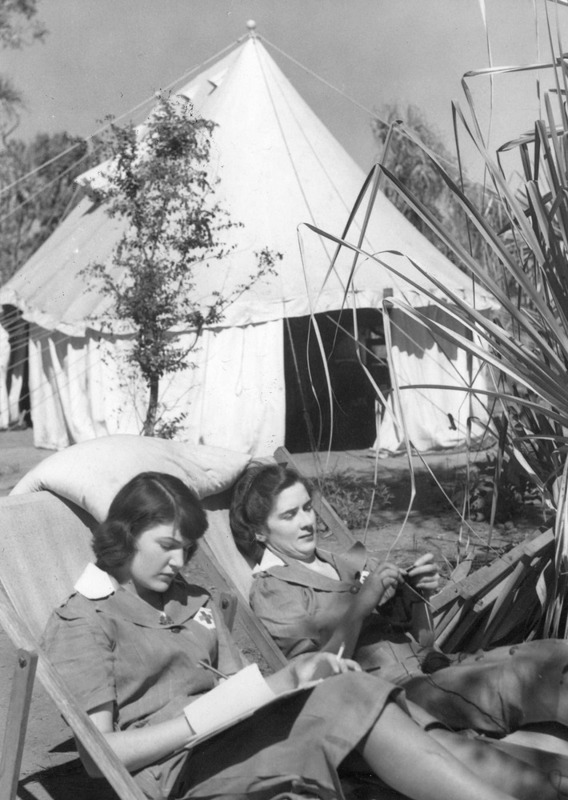 Two nurses relax outside their Small Marquee H.P (Hospital Pattern) tent at Adelaide river.